This one pan mushroom Asiago chicken recipe brought streams of people in from the hallway to our test kitchen. Everyone wanted to know what smelled so good! Asiago, an Italian cow’s milk cheese, tastes a lot like Parmesan but is a bit sharper. It melts nicely and is really easy to cook with—and even better to eat. The recipe only calls for a ½ cup of shredded Asiago. And while it may not sound like much, the cheese packs a serious punch of flavor. 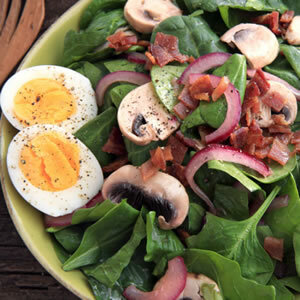 You can use any type of mushroom that you like! We used a button variety, but cremini works just as perfectly. If you’ve got the budget and are able to hunt them down, morels or trumpet mushrooms are delicious, too. White wine adds a nice dimension of flavor. Sherry, port or marsala are all good substitutes if you don’t have the vino. And if you happen not to have any of those options, adding a little extra chicken broth will still make everything fantastic. 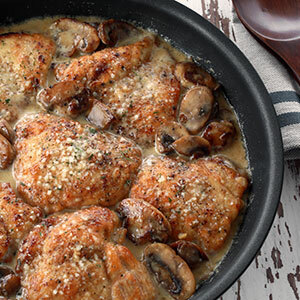 Make mushroom Asiago chicken using einkorn flour! Cut each chicken breast into cutlets. Lightly season each cutlet on both sides with salt and pepper and dredge in flour, shaking off any excess. When all of the chicken is cooked and set aside, add remaining butter to the skillet along with the mushrooms and ½ tsp salt. Cook for about 10 minutes, stirring occasionally, until the mushrooms are golden brown and become softened. Add garlic and cook for an additional 2 minutes. Reduce heat to medium-low and stir in heavy cream. Sprinkle the Asiago cheese over the top of the sauce and stir constantly until the cheese melts. Nestle the chicken back into the skillet and allow it to simmer in the sauce just until the chicken is heated through and the sauce has slightly thickened. Sprinkle with a bit of Parmesan cheese and serve right away, either all by itself, or spooned over pasta or mashed potatoes. Enjoy! Be patient with step 4 in the recipe! You'll want to let the sauce cook down until it is reduced by half before adding the chicken back in. This way it is more flavorful and the chicken won't be overwhelmed by too much sauce.